The Rush" lampooned in an 1870 issue of Harper's Magazine. Image courtesy of Terence Young. Summer 1868 passed as an unremarkable season at Saranac Lake in New York’s Adirondack Mountains. The weather was fine, the scenery delightful, and the usual array of 200 to 300 recreational hunters and anglers passed through the small settlement on their way into the wild lands beyond. The summers of 1869 and 1870, however, were an altogether different story. The weather was more or less the same, and the scenery continued to entrance, but instead of a handful of sportsmen came a multitude of men and women from points east and south to enjoy America’s newest recreation—camping. Almost to a person, they had been inspired by what today, at the beginning of the 21st century, we recognize as the watershed book in the history of American camping: the first comprehensive “how-to-camp” guidebook, Adventures in the Wilderness; or, Camp-Life in the Adirondacks, which had been written in April 1869 by a young minister named William H.H. Murray. Promoting a powerful combination of nature as spiritual and physical cure, and camping as an open and equal activity, Murray’s book took a previously quiet region and transformed it into a nationwide destination, and gave Americans a new, reassuring form of leisure. William Henry Harrison Murray was born in 1840 to a modest New England family whose ancestors had been among the first settlers of his hometown, Guilford, Connecticut. His boyhood was an enthusiastic mixture of study, farm work, and outdoor recreation. “Bill,” as he was generally known, learned to shoot, hunt, and fish, even as he developed a voracious reading habit and a taste for literature. Gregarious and energetic, Murray entered Yale College in fall 1858, and upon graduating immediately married Isadora Hull, who also loved the out of doors. Determined to become a minister, Murray entered the Congregationalist East Windsor Seminary near Hartford, Connecticut where he finished his theological studies in 1864. He then served in a succession of increasingly prosperous and prestigious churches in Connecticut and Massachusetts, most famously at the Park Street Church in Boston. During these years, Murray earned a reputation as a church leader and as an eloquent, engaging speaker, but he also gained notoriety for enjoying such outdoor recreations as hunting and fishing, which Congregationalists generally discouraged because they viewed these sports as undermining pastoral zeal. Murray took his first camping vacation in the Adirondacks in summer 1864 and returned annually for many years. He canoed and hiked widely; his favorite campsite was on Osprey Island at Raquette Lake. Occasionally Murray brought parties with him, which could include not only his friends, but his wife and his friends’ wives. 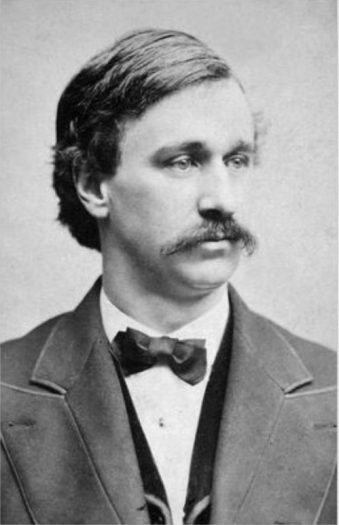 Smitten by the Adirondacks’ beauty and the leisure time he enjoyed there, Murray started writing about his trips in a series of lively, often humorous “narrative exercises.” Such compositions were common among ministers who worked on animated, cheerful essays to improve their ability to devise engaging sermons. In Murray’s case, the subjects included canoeing, hunting, fishing, and the powerful beauty of nature. The voice was steadily self-deprecating and ironic. William H. H. Murray. Photo courtesy of Terence Young. Adventures in the Wilderness was met with mixed reviews. The Overland Monthly dismissed Murray’s writing as “gorgeous French, badly translated” while The Nation found his practical advice to be “sensible and worth taking.” Nonetheless, the book was immediately popular with the public and a tremendous commercial success, making Murray both famous and wealthy by June. We do not know exactly how many copies were sold, but the numbers probably rose into the tens, and perhaps hundreds, of thousands. The book was in its tenth printing by July 7. Years later, Murray recalled that for a long time Adventures had sold at a rate of approximately 500 per week. Adventures produced its remarkable effect for several reasons. The Adirondacks were more accessible than ever, as railroads and a telegraph line reached the region’s margin in 1868. The post-Civil War economy was booming, which increased middle class wealth and made it possible for more people to buy Murray’s book and act on his advice. Finally, Murray’s book had substance. Adirondack travel literature published prior to Adventures had offered readers little useful information, but the long introductory chapter in Murray’s book offered a great deal of practical advice. Murray explained how to get to the Adirondacks, how to avoid pesky insects, where to buy equipment, which qualities to value in a guide, a few names of local guides, and what accommodations were available. He told nascent campers what gear to bring, and what to leave at home. Furthermore, Adventures produced its dramatic popular response because Murray was the first writer to present camping as pilgrimage. In its simplest form, a pilgrim is someone who leaves home, journeys to a sacred place as an act of devotion, and returns home changed; personal motivations vary, but pilgrims typically seek escape from the routine and restrictions of ordinary life in order to find spiritual satisfaction and comfort, as well as other desired objectives like wealth, longevity, or happiness. Pilgrims need not be religiously oriented, and in the United States they have tended not to be. American pilgrims frequently headed out of cities to rural and wildland areas for family reunions, revivals, and the like even before Adventures appeared. Murray, unlike his literary predecessors, placed camping within this American pilgrimage pattern. He held out the Adirondacks as a sacred place that could act as a balm to everyday iniquities. American life had changed rapidly after the Civil War, which had spurred widespread industrialization and urbanization. Growing cities offered enhanced employment options, improved amenities, and a host of other attractions, but also assaulted their residents. Smoke, noise, and crowding; shifting gender, class, ethnic, and other social relations; increased social diversity and stratification; production schedules and pervasive regulation, and other rapid changes left many city dwellers confused, alienated, and with their sense of identity unmoored and adrift. 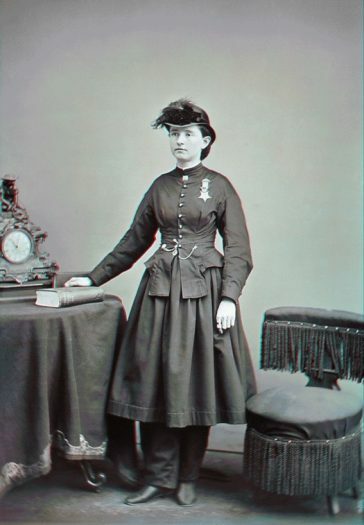 Dr. Mary Edwards Walker, a Civil War surgeon wearing the “Turkish Drawers” outfit described by Murray. Photo courtesy of Terence Young. Pilgrimage often involves some equalizing of the social divisions that occur in everyday life. Murray broke the gender barrier by insisting that camping was “delightful to ladies. There is nothing in the trip which the most delicate and fragile need fear. And it is safe to say, that, of all who go into the woods, none enjoy the experiences more than ladies, and certain it is that none are more benefited by it.” To cement women’s interest, his book detailed the components for a “Ladies Outfit,” including gloves with “armlets,” a felt hat, a “flannel change throughout,” waterproof footwear, and a “short walking-dress, with Turkish drawers fastened with a band tightly at the ankle.” No woman, in Murray’s opinion, was to avoid camping because she feared for her health or safety. With Murray as its suddenly famous proselytizer, camping exploded onto the American scene—for men and women, young and old. Adventures was a well-written and practical book, but more than that, the public was ready for its message. The Adirondack summers of 1871 and afterward were never again as wild as those of 1869 and 1870, but that was only because Saranac Lake’s facilities expanded, and an ever-increasing number of campers spread out to surrounding regions. When William H.H. Murray told America’s growing middle classes that their cities were profane and that pollution, regulation, and crowding were destroying their sense of belonging, they agreed—more than anyone, even Murray, had suspected was possible. Terence Young is Professor Emeritus of Geography at the California State Polytechnic University, Pomona. He has written numerous books and articles on the American love affair with the natural environment and is the author of Heading Out: A History of American Camping.